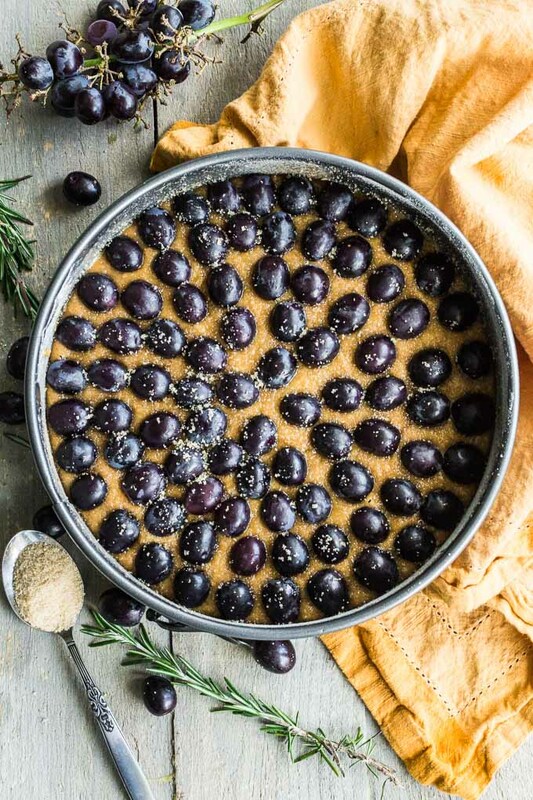 Rosemary Grape Ricotta Cake is fragrant, juicy and a little decadent. 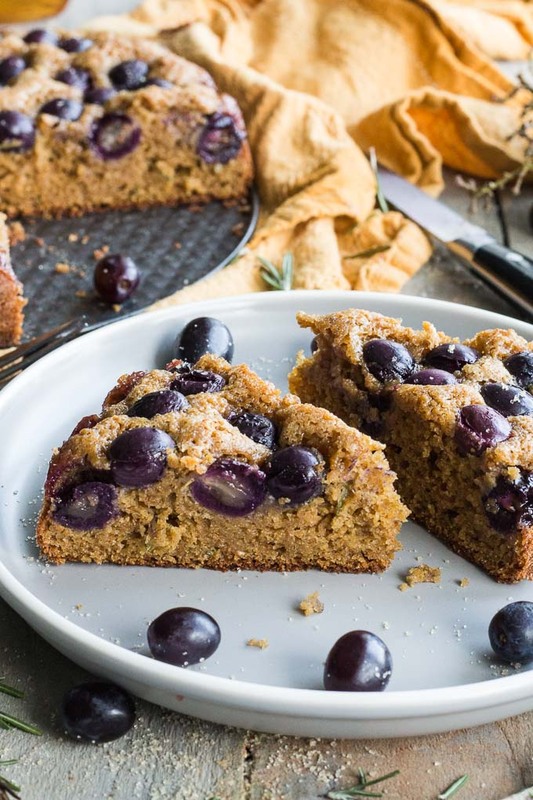 It’s the perfect cake for snacking, especially if you’re looking for a little treat with some added clean ingredients like whole wheat flour, olive oil and coconut sugar. If you’re anything like me, weekends are for baking. Long before I started blogging, I spent my weekends baking in the kitchen. I usually gave most of it away, or stored it in the freezer for special occasions, but the important thing for me was the stress relief it provided. People talk about carving out ‘me time’ or time for ‘self-care’. Well, baking is my ‘me time’ and my ‘self-care’. As long as I have my 80s music going, I could get lost in the kitchen for hours. 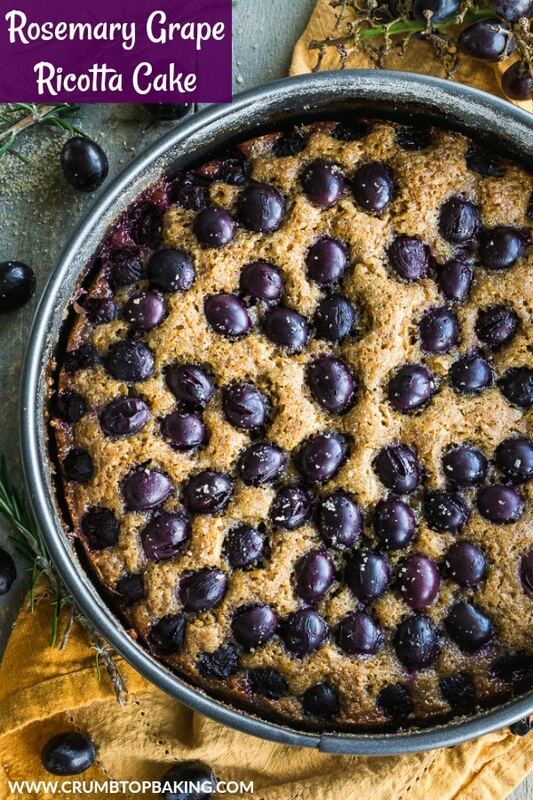 So that’s exactly how this Rosemary Grape Ricotta Cake came to be a few weeks ago. I woke up one Saturday morning, and instead of diving into blog work, I thought I would go through some of my magazines and look for something that I could bake just for fun. And that’s when I came across a recipe for a Fresh Fig and Ricotta Cake in Food Network Magazine’s October 2018 edition. The cake is from Ina Garten’s new cookbook, Cook Like a Pro. I didn’t have the fresh figs, since they’re usually difficult to find in Newfoundland, but I had some gorgeous plumcots (also called pluots, a cross between a plum and apricot), so I decided to give them a try. I subbed in whole wheat flour and coconut sugar, but otherwise, kept the recipe the same. It turned out beautifully! The ricotta created a spongy texture, and the plumcots added a sweet taste. You can check it out on Instagram, where I posted it a few weeks ago. Since the cake was a success, I decided to make it again but with a few other variations. I used extra virgin olive oil instead of butter, and used black seedless grapes and fresh rosemary instead of the plumcots. The rosemary added a fragrant touch, and the grapes made for a sweet and juicy topping. But my favourite part was the extra virgin olive oil. It paired nicely with the ricotta, and added extra moisture and sponginess to the cake. While I’ve made versions of this cake with plumcots and black grapes, it would work well with so many different types of fruit. Other varieties of plums and grapes would work, as well as different types of berries and stone fruit. If you’re not a fan of rosemary, you can totally leave it out of the cake. It’s still flavourful without it, I just like the fragrance it adds. This cake can be stored in an airtight container on the counter, but because of the high moisture content, if you’re not going to eat it within a day, I would store it in the fridge. The recipe calls for sprinkling cane sugar on top of the cake before baking. You don’t need to do this, but it adds a nice, crispy layer on top when it bakes. 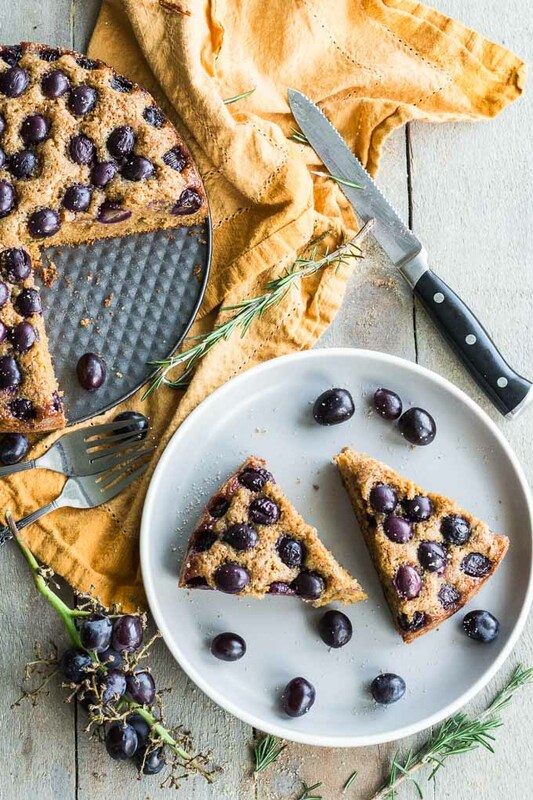 It might be early, but dare I say this Rosemary Grape Ricotta Cake would make a perfect holiday dessert? It comes together quickly, and has a festive vibe, especially if you go with toppings like cranberries and white chocolate! 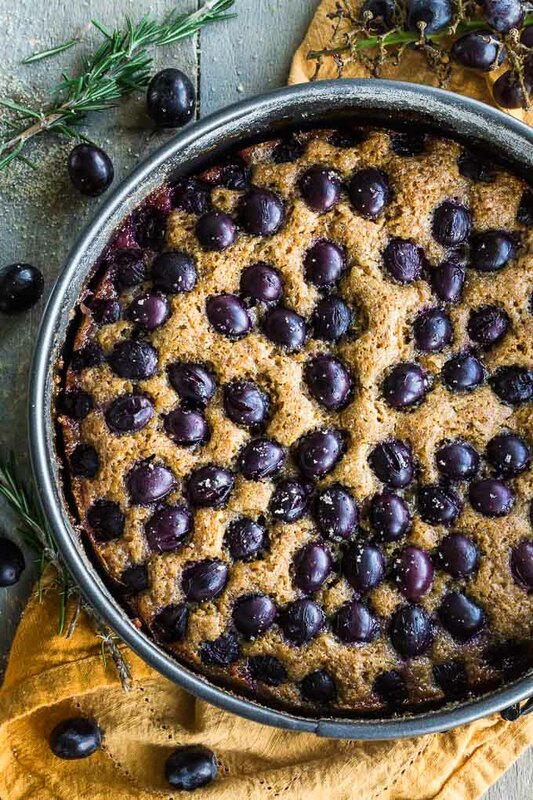 If you make this Rosemary Grape Ricotta Cake, or a version of it using different toppings, I would love to hear about it in the comments below. 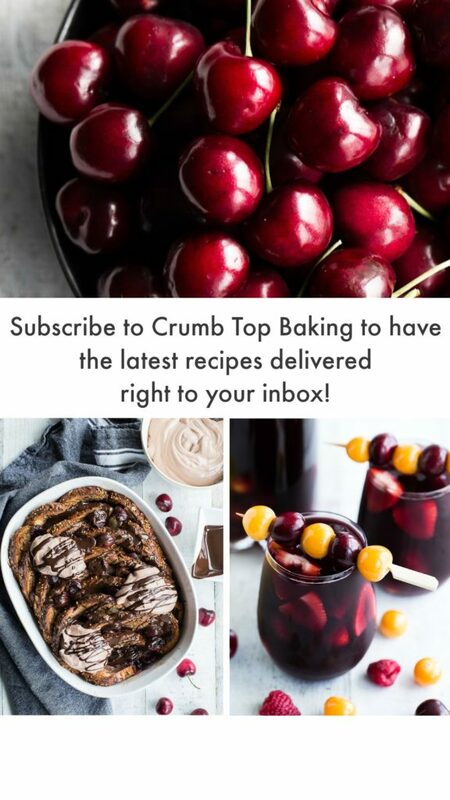 Be sure to take a pic and share it on Instagram by tagging @crumbtopbaking and using the hashtag #crumbtopbaking. Pre-heat oven to 375F, and grease a 9-inch springform pan. In a large bowl, combine the sugar and oil and mix with an electric mixer until combined. The mixture will be gritty. On medium speed, add in one egg at a time, mixing well after each addition. Add in the ricotta, sour cream, vanilla and lemon zest, and mix on medium speed until well combined. You may need to stop and scrape down the sides of the bowl. The mixture will still look a bit gritty. In a small bowl, sift together the flour, baking powder and salt. Add to the wet mixture, and blend on low speed until just combined. Don’t over mix. Stir in the fresh rosemary, and pour the batter into the prepared pan. Arrange the whole grapes in a single layer on top of the cake, and sprinkle on the cane sugar. Bake for 40-45 minutes, or until a toothpick inserted into the centre of the cake comes out clean. Let cool on a wire rack before removing from the pan and cutting into slices. Store cake in an airtight container on the counter for a day, or in the fridge for 3-4 days. This recipe is adapted from Ina Garten’s recipe for Fresh Fig and Ricotta Cake from her new cookbook, Cook Like a Pro and also found in Food Network Magazine’s October 2018 edition. Thanks so much Dana! We would definitely have fun baking together! Glad you share my love for 80s music! 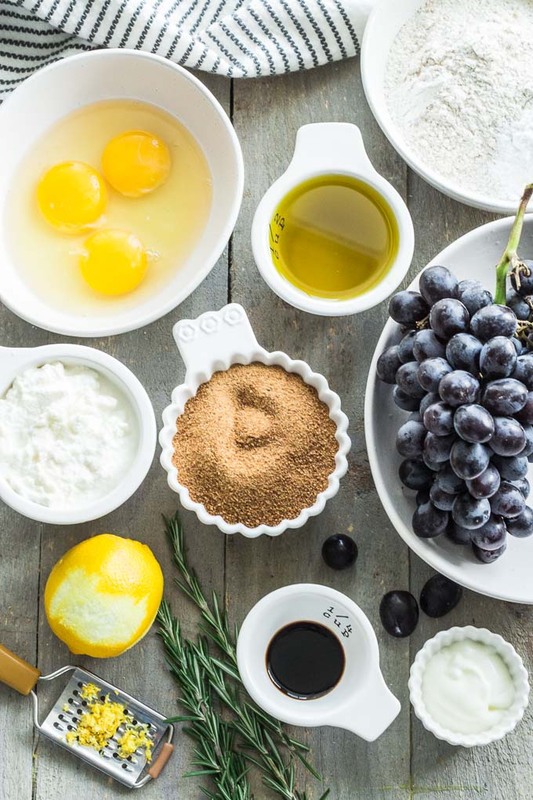 I love baking with ricotta as it adds such a great texture to baked goods. This was my first time baking with grapes, and I will definitely do it more often. Hope you had a lovely weekend! Great recipe! I had no idea plumcots existed…haha. Looks delicious though. And another incredible set of pictures! Thanks Terry! I had no idea plumcots existed until recently. And I’m glad I discovered them. They are juicier and sweeter than plums, and perfect for baking. Happy Sunday! Amazed by the fact that this beautiful (almost decadent looking) cake contains wholesome ingredients. And all those flavors!!! I bet it tasted divine. Thanks Neha! I’d probably still classify this cake on the decadent side, but I tried to include some clean ingredients! And yes, it has lots of flavour, especially from the rosemary. Hope all is well! Thanks Dawn! As it baked, the cake created this lovely sweet smell in the kitchen. And you could definitely smell a hint of rosemary! I didn’t have to freeze this one either. It was gone within a few days! Looks so yummy and those grapes just make me want to bite into them! Thanks Kelly! The grapes were super juicy! Glad they make you want to bite in! Happy weekend! Thanks Patrick! It was my first time combining rosemary and grapes together, but they are definitely a great pair! Hope you had an awesome weekend! We’re friends for a reason–weekends have always been my baking time :). I, too, always gave my baked goods away (still do) but blogging has given me so much more purpose when it comes to baking. I feel less guilty pawning sugar off on people now because I refer to those people as my taste-testers rather than the people I’m just force-feeding calorie bombs, haha! This cake sounds DELICIOUS! And it’s soooo pretty too. Hope you have a great week, Leanne! Haha! Love it! Weekends spent baking are the best, and taste testers play a valuable role! 😉 Thanks Kelsie. Hope you have a great week too! This cake is absolutely stunning Leanne! I’ve never baked with grapes so this is inspiring me. 🙂 Adding fragrant rosemary (my favorite herb) sounds like a lovely touch and I love how moist ricotta makes baked goods. I’d love a slice! Thanks so much Marcie! This was my first time baking with grapes, and I was pleased with the result. I’ll definitely try another grape recipe next season. As for rosemary, I have definitely been on a kick lately. It is just such a lovely herb for sweet or savoury recipes! What a GORGEOUS cake Leanne! I bet it tastes just delicious too. I’ve got to give it a try! Your photos are stunning! Thanks so much Mary Ann! Appreciate it 🙂 Have a great week! What a delicious recipe Leanne! You are just so creative when it comes to food. I also love how beautiful this cake looks. Thanks so much Christie! I enjoyed making this cake! I’ll definitely be making it again. Enjoy the rest of your week! Wowowow! This is all I’ll want until I get it!! Such a beautiful decadent cake! So creative, my friend! Pinned! Thank you Annie! I can’t wait to make this one again! Appreciate you pinning. Have a lovely week! Such a lovely cake! I’m so curious to try the grape and rosemary together – I bet it’s wonderful! Thanks Kelly! Grape and rosemary are a nice combo in sweet or savoury dishes. You definitely need to try the combo! I could also spend HOURS baking in the kitchen, especially if I had an assistant to do the dishes 😉 I have never seen a cake with grapes like this before! So unique. As always, I love the healthier ingredients you use, Leanne. It looks terrific! Thanks Katherine! I love weekends, and I love my kitchen time. Thankfully, my hubby graciously helps clean up the huge mess I make in the kitchen! Glad you like the healthier ingredients. I love the challenge of trying to make desserts a little healthier! Yes! Me too, Leanne. Love to just hang out in the kitchen, cooking or baking, usually listening to a podcast. This cake looks superb! Love your adaptations! Thanks Elaine! Yes, weekends are the best like that. And podcasts are great to have on too! Such a fantastic combination of flavours. I love the touch of rosemary – really compliments the grapes beautifully. Thanks Yvonne! Grapes and rosemary are an awesome combo – in both sweet and savoury dishes! What a beautiful cake, Leanne! I love it because I have a bumper crop of grapes, and I’m sure people are tired of getting grape jelly from me every year, lol. Can’t wait to make this. Thanks Colleen! I hope you get a chance to make this cake with all of your grapes! 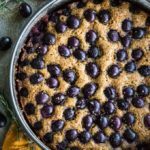 I love everything about this cake and it’s simply perfect during the grape harvest season! It looks so moist, pretty and yummy…definitely my kind of cake! Thanks Marisa! The ricotta and the olive oil keep the case moist, and the grapes are great this time of year. I’m planning to make this cake year round with other fruit toppings! Hope you’re having a lovely week! Leanne I’m so excited about this recipe. I can’t wait to try it out. I have a big thing of ricotta in my fridge – so I will definitely be baking this on the weekend. It looks absolutely delicious, and I love that it’s sort of sweet and savoury at the same time. Thanks Kristen! If you have the ricotta, it was meant to be! Let me know what you think if you make it! Thanks Terri! Rosemary is so versatile. Love that it works in both savoury and sweet dishes. I hope you get to Newfoundland some day soon too! Happy Monday!